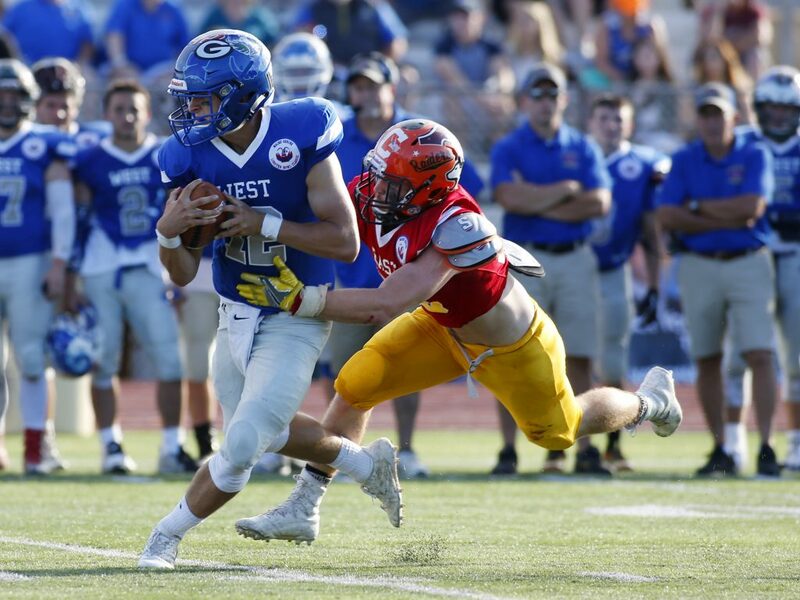 Defense sets the tone, and East QBs Braden Ballard and Grant Hartley combine for three touchdown passes. 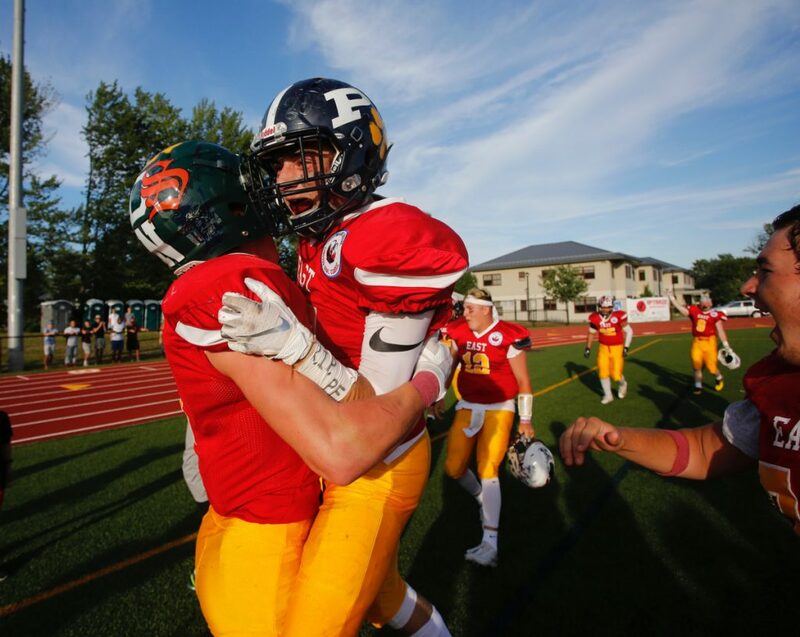 Vinnie Pasquali of Portland High celebrates with East teammate Colby Lee, left, of Mt. 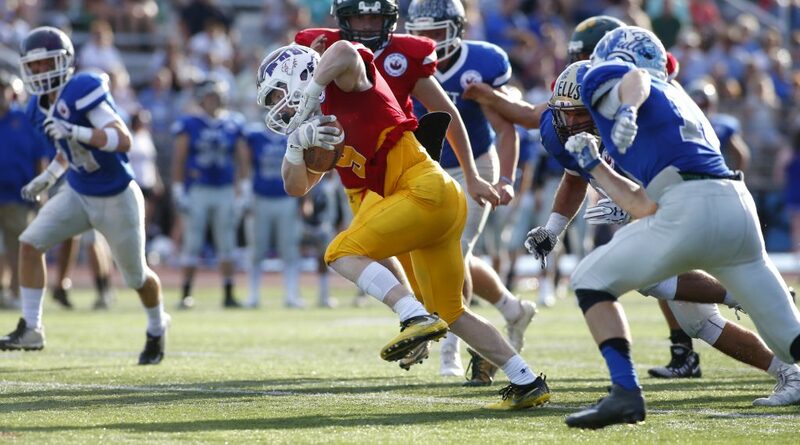 Desert Island after Pasquali returned an interception for a touchdown in the fourth quarter of the Maine Shrine Lobster Bowl Classic on Saturday at Thornton Academy. 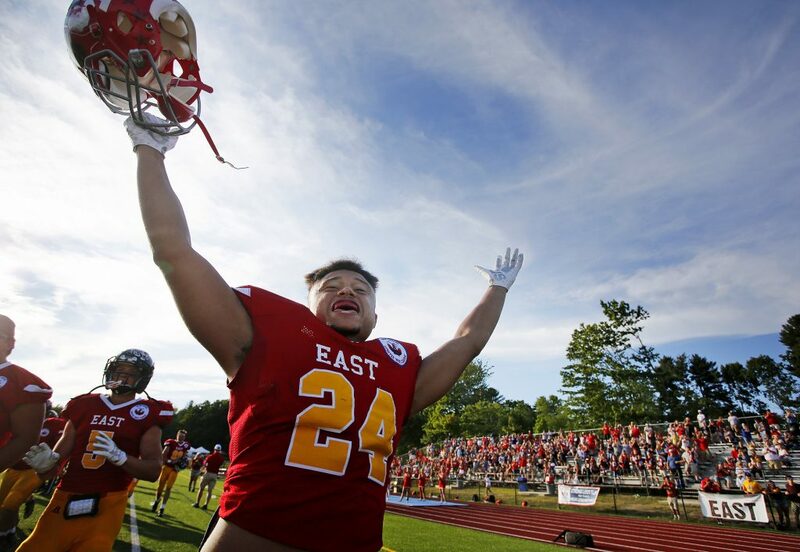 The East won, 40-14. 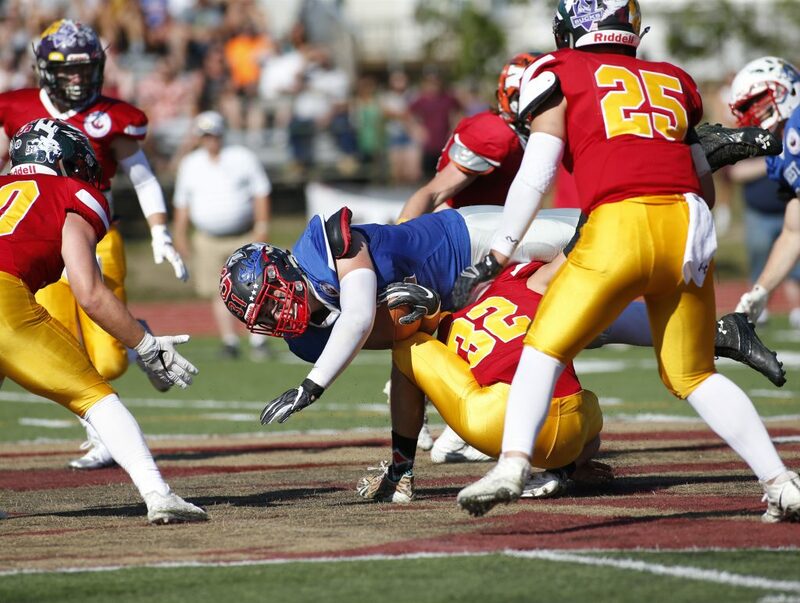 SACO — Playing for pride, respect and, in some cases, for those they had lost, the East embraced its underdog role Saturday and dominated the West in the 29th Maine Shrine Lobster Bowl, winning 40-14 at Thornton Academy’s Hill Stadium. 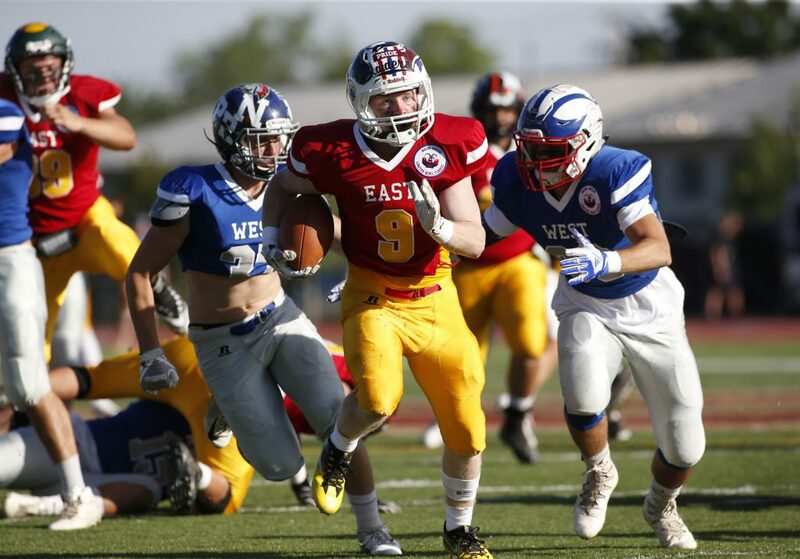 The East defense shut out a star-studded West offense for nearly three quarters while building a 20-0 lead, and a balanced offense did the rest. 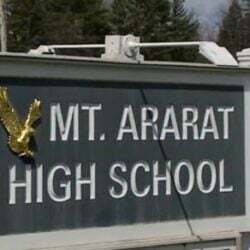 East quarterbacks Braden Ballard of Lawrence and Garrett Hartley of Edward Little combined for three touchdown passes, and East offensive MVP Austin Pelletier of Messalonskee (14 carries, 115 yards) and Garrett Poussard of Lewiston (eight carries, 106 yards) each rushed for a touchdown. The East has won four of the last six meetings. The West leads the series, 19-10. In most circles, the West was seen as a heavy favorite because of its star power and the dominance of South teams during the 2017 season. 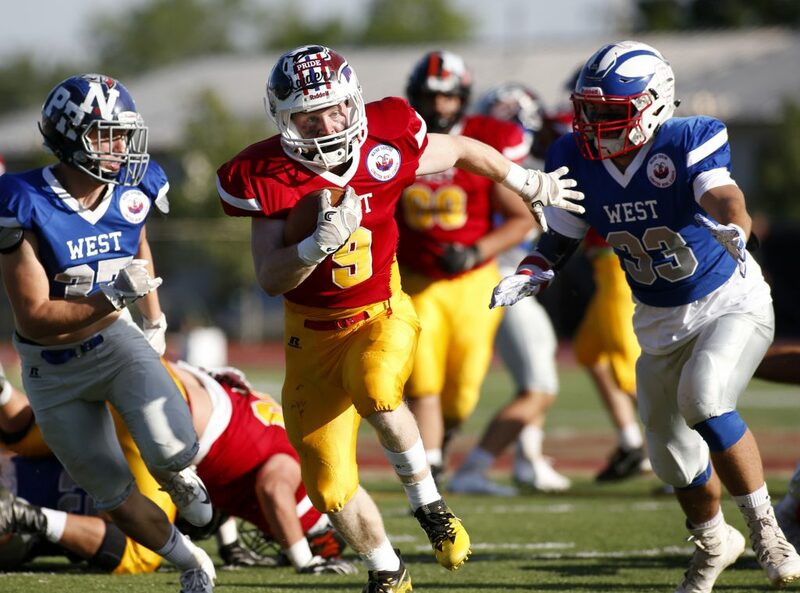 The West featured Fitzpatrick Trophy winner Owen Garrard of Scarborough at running back and Fitzy finalist Jack Bryant of Falmouth at quarterback, but didn’t score until late in the third quarter. 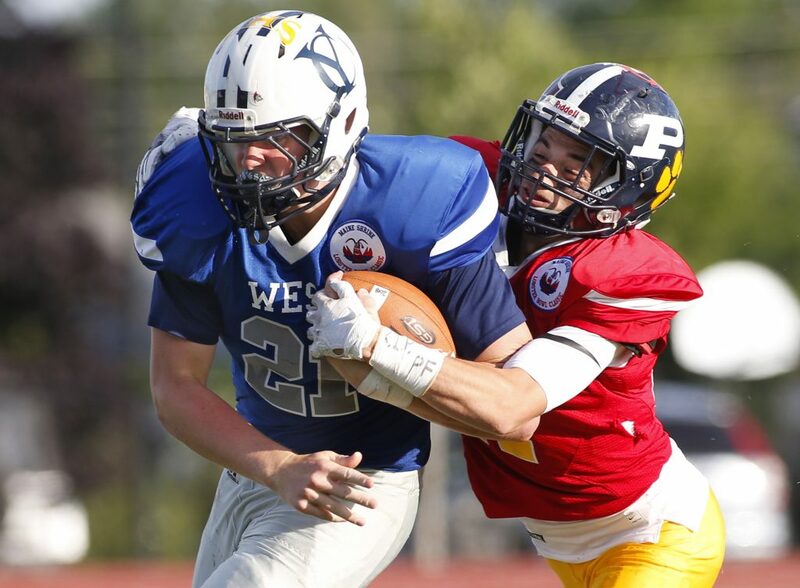 When defensive lineman Tyler Bean of Brewer halted the West’s first drive with a quarterback pressure and then a 12-yard tackle for loss, it was obvious the East was playing with a chip on its shoulder. 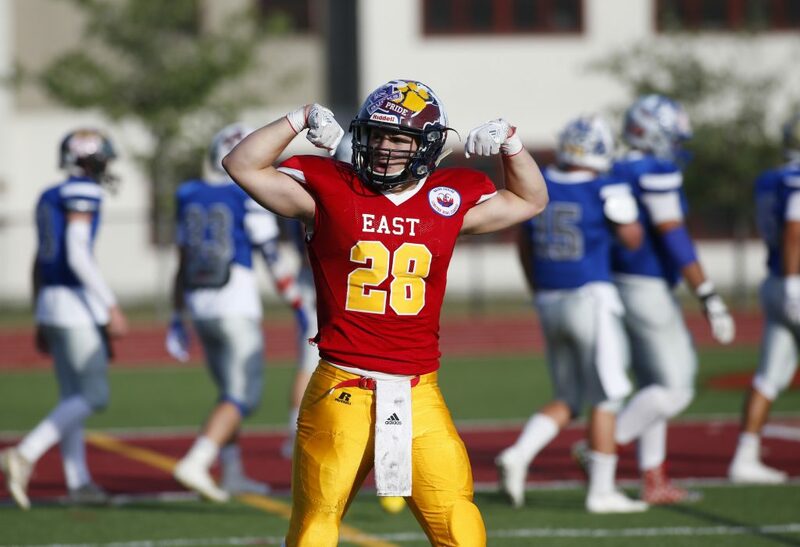 The East’s commitment to the Lobster Bowl game, and its purpose of raising money for Shrine hospitals throughout North America, was exemplified by Dexter’s Tyler Beem, a 5-foot-10, 160-pound linebacker who flew around the field making tackles. Beem raised $12,322, the most ever by a Lobster Bowl player, inspired by his friend and classmate Matt Simpson, who died Friday night after a battle with cancer. A moment of silence was observed for Simpson prior to the game. “Our coaches said play for the kids down there (at Shrine hospitals). 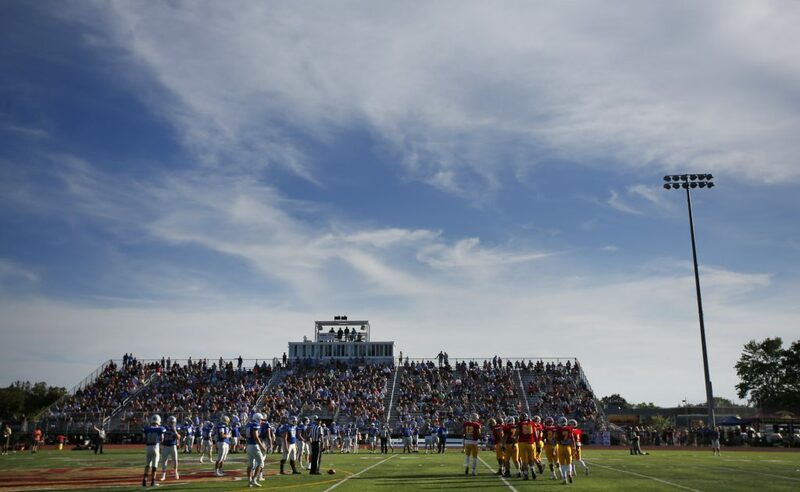 Play for the people that couldn’t make it to this game. Play for anybody. Find someone that you thought was important to you, play for that person,” Beem said. The West defense, led by MVP Cam Houde of Thornton Academy, linebacker Ryan Weare of Cape Elizabeth and free safety Kyle Glidden of Marshwood, also played well through most of the first half. 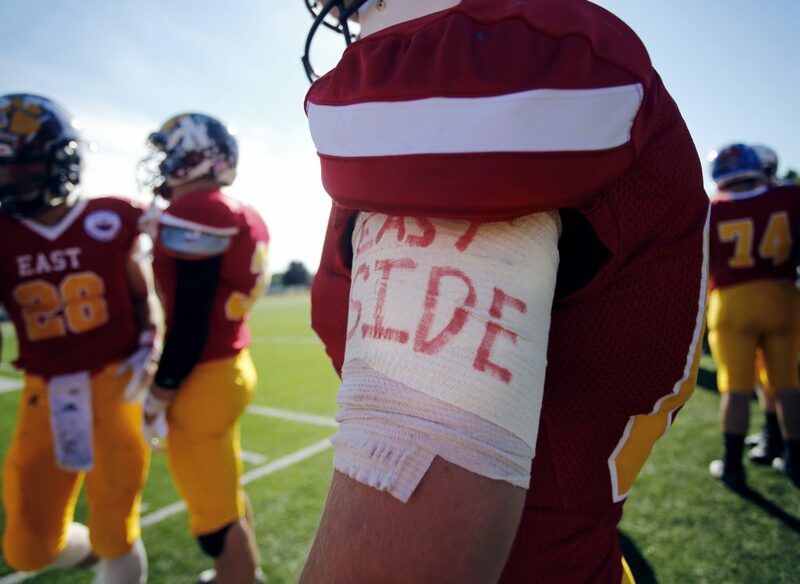 But gradually, the East’s offensive line started to open up seams. 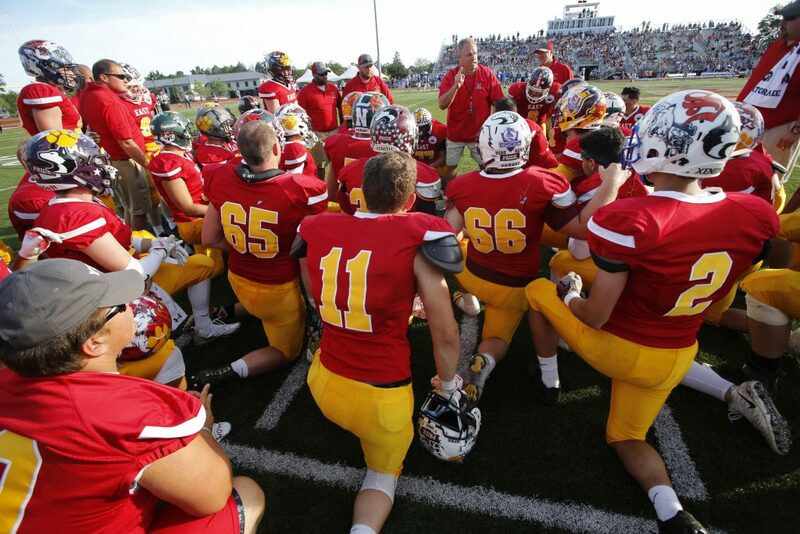 The East used a seven-man rotation up front, with Brunswick’s Bailey Pelletier, Max Friedman, Elijah Gagnon sharing time with Marcus Canty of Windham, Ethan Kane of Ellsworth, Damon Reynolds of Houlton and center Jarrod Taylor of Oxford Hills. 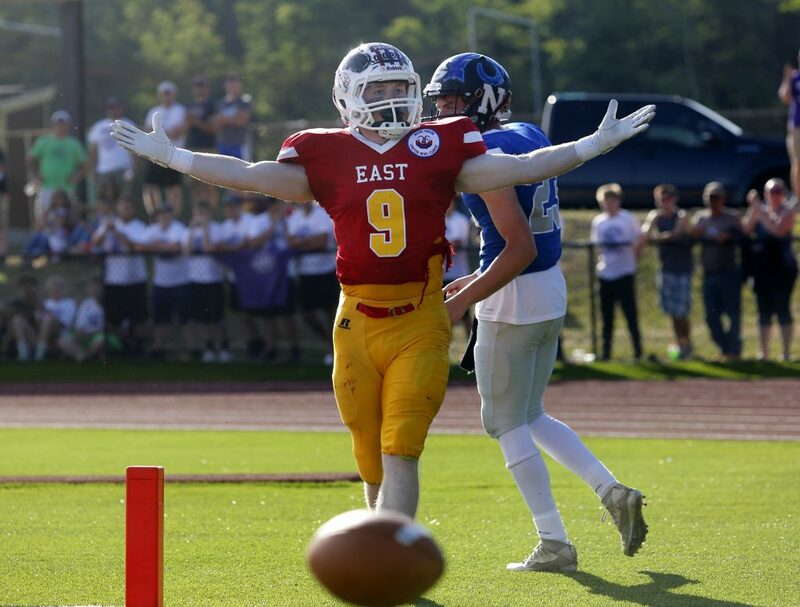 The East opened the scoring with a 56-yard pass from Ballard to Jordan Roddy of Cony with 9:15 left in the second quarter and led 6-0 at halftime. On the East’s first play of the second half, Ballard hit Jon Bell of Skowhegan in stride and the speedster went untouched 84 yards. Pelletier busted off right tackle for a 42-yard score, and Ryan Fredette of Winslow added the 2-point run for a 20-0 lead. The West got on the board with an 84-yard drive as it opened up the offense. 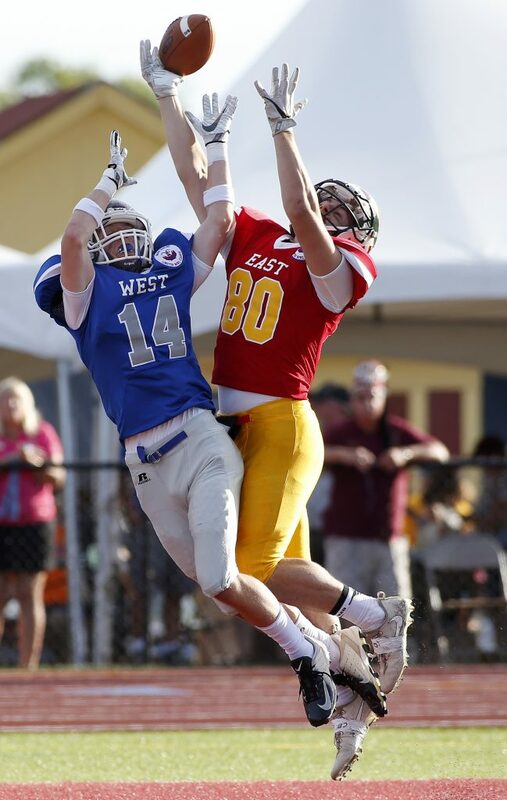 Bryant, the West offensive MVP, completed four passes, including a 39-yarder to Sean Whalen of Madison. Glidden rushed for a first down on fourth-and-6, leading to Bryant’s 4-yard scoring run with 1:07 left in the third quarter. 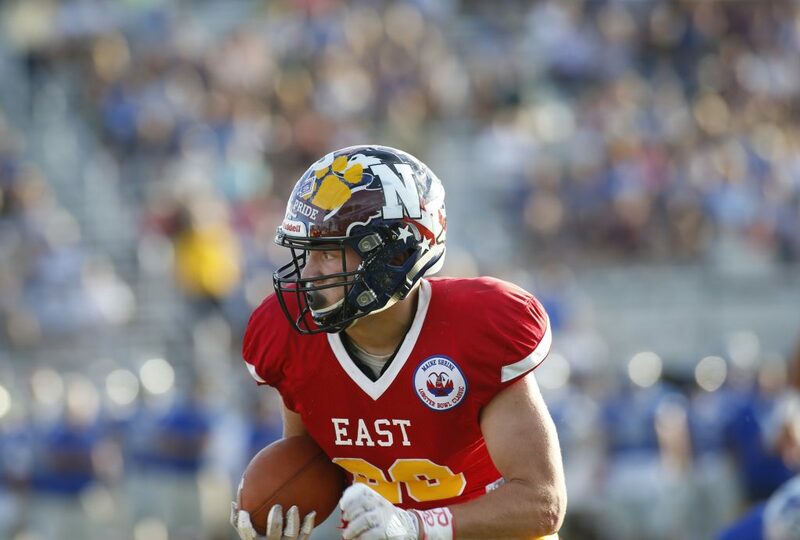 The East responded with a 70-yard drive capped by Hartley’s 14-yard pass to Oceanside’s Jack Freeman. Poussard added a 4-yard TD run in the fourth quarter, set up by his own punishing 30-yard run. Bryant connected on a 51-yard TD pass to Whalen with 5:25 to play. 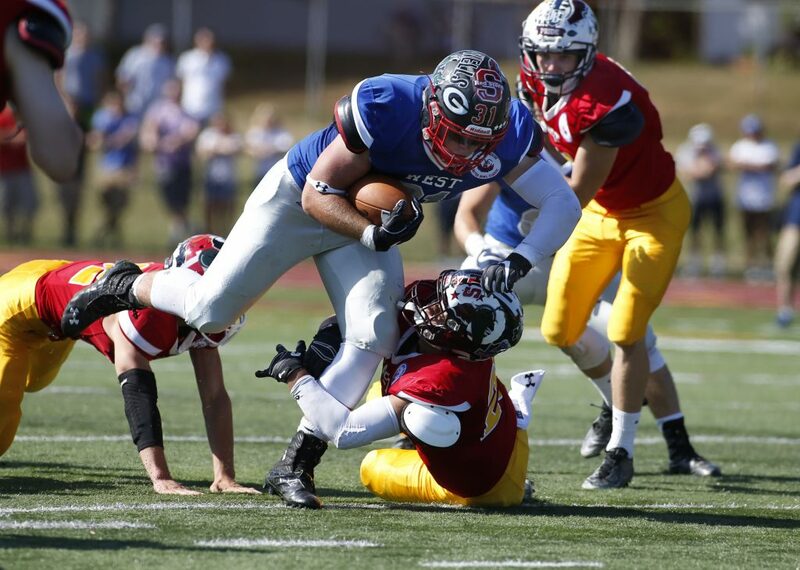 Portland’s Vinnie Pasquali finished off the victory in style with a 48-yard interception return. 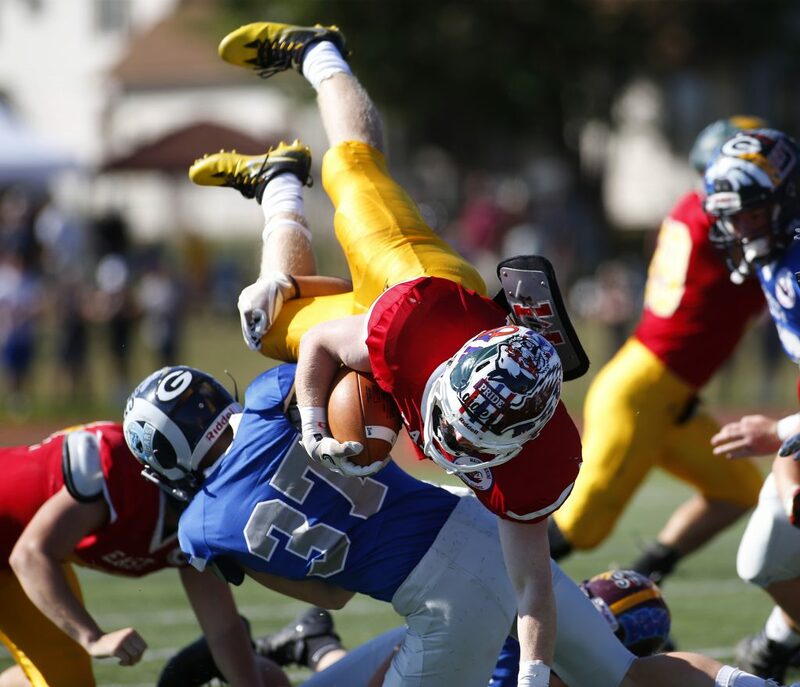 He was named the East defensive MVP. 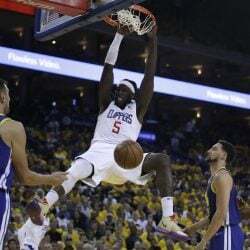 “We talked about all week that we were going to come out strong and fast and take them by surprise, and once we got the momentum, we kept going,” Pasquali said.